Manufacturers share a wealth of knowledge with each other every day. This happens at networking events, trade shows, and now even more prominently than ever — through blogs. Here are 7 industrial manufacturing blogs that every manufacturer should read on a daily or weekly basis. They are updated fairly regularly, and are full of interesting and useful information. 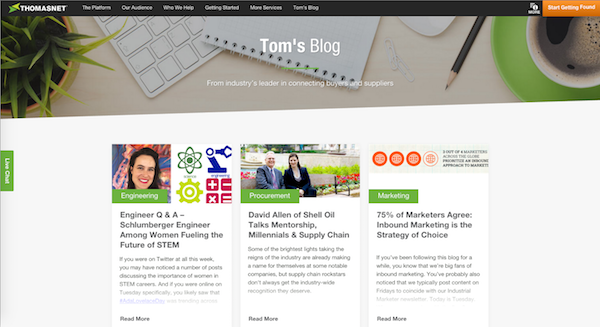 The ThomasNet blog shares resources and helps connect buyers with suppliers. Updated on an almost daily basis, this is a great go-to place to find fresh, industry-specific content. Shopfloor is an incredibly in-depth, well maintained blog that looks at hard data and analyzes it. They have a pretty fantastic “Monday Economic Report” every week as well. The Manufacturing.net blog is full of news, commentary, and analysis that is pertinent to any manufacturer. For me, it’s a daily read. This blog is well-maintained, with articles being posted almost daily regarding the latest news in American manufacturing. The manufacturing outlook has a host of well-educated authors, and tends to take an economic look at the manufacturing industry. The reshoring initiative blog publishes a monthly newsletter and additional posts regarding the “reshoring” of manufacturing to the United States of America. While this is a regional blog, it does a great job of highlighting the local activity in the Dayton, Ohio region. It’s maintained by two individuals who simply want to see the Dayton Ohio region to see growth. Do you read any industrial manufacturing blogs regularly? Drop the link in the comments below!